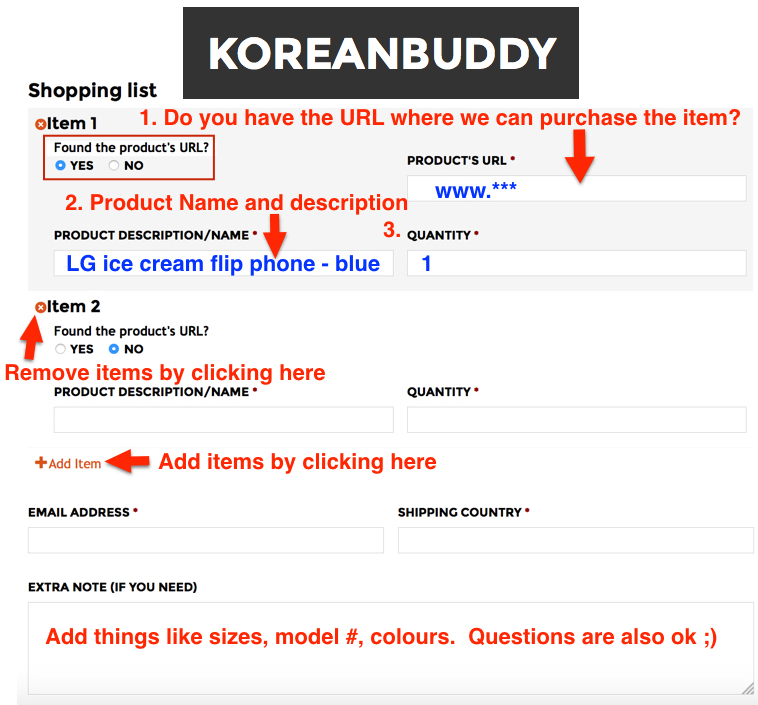 In this guide I am going to show you exactly how to find specific items, pick options and sizes, and the get the required information to order off of Qnigirls using KoreanBuddy. 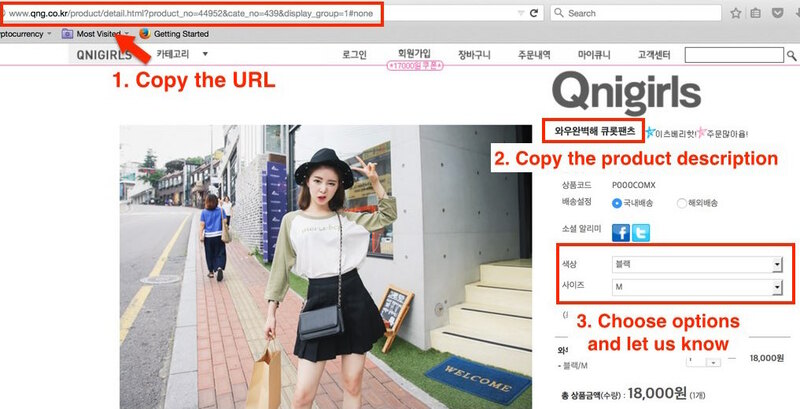 Qnigirls only has a Korean site. This site has young fashions and good prices. You can see girls in their teens, 20’s and early 30’s wearing these fashions in Korea. Product #1: Ripped jean shorts – The easiest way to search this site is with the category menu in the top left corner (shown in photo). Pants and shorts are grouped together on this site under “bottom” in the menu, so click pants “ 팬츠”. I translated all the other menu items for you as well. Scroll down about halfway to see shorts. 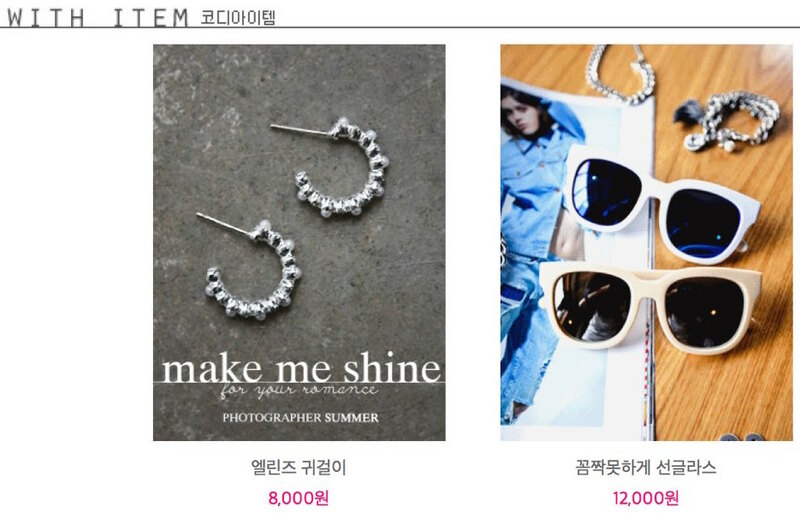 I couldn’t find anything I liked for under 20,000 won, so I choose some for 22,500 won. Product options are only shown in Korean, you have to pick the color (top option) first before you can select your size. Remember Korean S = American size 4, M = size 6 and L = size 8. See the clothing size charts for more details. To order these shorts 1. copy the URL and paste it into the order forms on KoreanBuddy 2. copy and paste the product name. 3. Tell us the options you want, color and size etc. Here there are 3 sizes S,M,L. 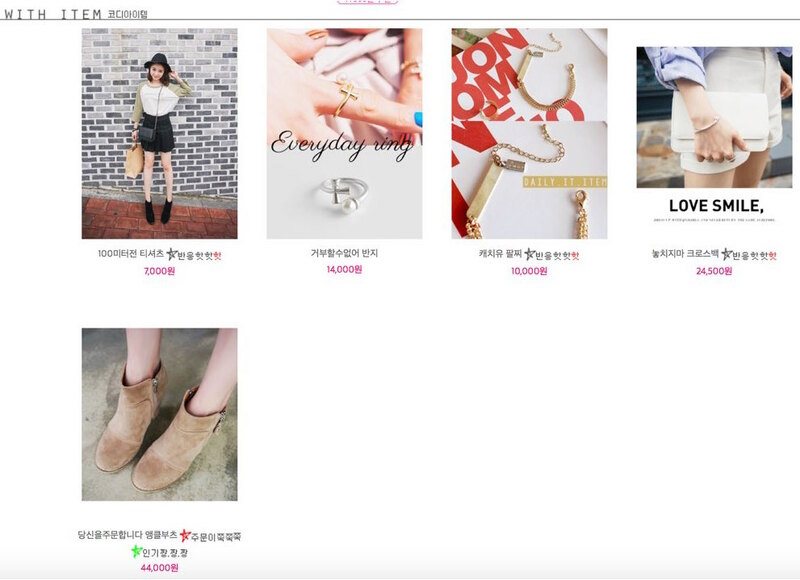 Almost at the bottom of this page they show the “with items.” These are the items that the model is wearing in all the pictures. If you scroll up a little from the bottom you can also see similar items shown, maybe you can find something you like better here. Product #2: A-line black skirt. Skirts are also under “bottom” in the top menu. Click “스커트,” skirt. They aren’t grouped by style so you just have to look through the options. I spent a little extra on the shorts so I am choosing a black skirt for only 18,000 won! Most young Korean girls have this skirt in their wardrobe, it’s standard. The options are again in Korean. Top one is color and bottom is size. To see the colors scroll down near the bottom and they are all shown with the Korean text next to them. To order this skirt 1. copy the URL and paste it into the order forms on KoreanBuddy 2. copy and paste the product name. 3. Tell us the options you want, color and size etc. If you have trouble with options or any questions just send me a message in the chat. Again, like the jean shorts you can see the “with items” which the model is wearing in the photos and the similar items just above that. If you have any questions, just ask me on the chat. This skirt comes in 5 colors shown here. The colors are shown near the bottom of the page.